About "Finding circumference of a circle worksheet"
Worksheet on finding circumference of a circle is much useful to the students who would like to practice problems on circles. 1. An irrigation sprinkler waters a circular region with a radius of 14 feet. Find the circumference of the region watered by the sprinkler. Use 22/7 for π. 2. The diameter of a car wheel is 21 inches. Find the circumference of the wheel. 3. The Ferris wheel shown makes 12 revolutions per ride. How far would someone travel during one ride ? An irrigation sprinkler waters a circular region with a radius of 14 feet. Find the circumference of the region watered by the sprinkler. Use 22/7 for π. Hence, the circumference of the region watered by the sprinkler is about 88 feet. The diameter of a car wheel is 21 inches. Find the circumference of the wheel. Hence, the circumference of the wheel is 66 inches. The Ferris wheel shown makes 12 revolutions per ride. How far would someone travel during one ride ? Distance traveled in one revolution is equal to circumference of the Ferris wheel. Then the distance traveled in 12 revolutions is equal to 12 times circumference of the Ferris wheel. 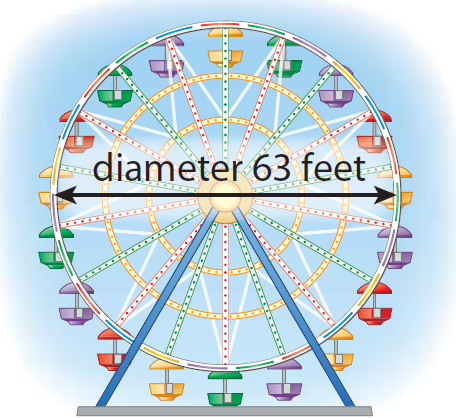 Let us find circumference of the Ferris wheel. The distance traveled during one ride is 2376 feet. After having gone through the stuff given above, we hope that the students would have understood "Worksheet on finding circumference of a circle worksheet".